Welcome to Found Off The Street, our look at cars found on the cape that rust liked so much it decided to summer there; Cape Cod, MA. Today we have a 1946 Ford Panel Truck. Similar to the 1957 GMC Panel Truck we saw two weeks ago this week's 1946 Ford Panel Truck is currently being used for commercial purposes. Although neither truck is in use anymore, they both sit in front businesses and attract attention. This Ford panel truck may not currently have the marks of several winters spent outside like the 1957 GMC, but given enough time on the cape that rust remembered, it will. FOTS is back on the cape this weekend and picking up where we left off two weeks ago with another Panel Truck. As we previously explained, before compact vans changed the commercial vehicle landscape in the early 60s, if you needed more enclosed space than a sedan delivery could provide you purchased a panel truck like this week's FOTS Ford. Panel trucks were the go to commercial vehicle for many years. Ford used a variation of the truck design seen here between 1942 and 1947. Like most other civilian vehicle production, Ford discontinued production of its trucks for non military applications during World War II. Only 3 months after the redesigned truck line seen here was introduced in December of 1941, production was halted in February of 1942 for non military applications. Early in 1945 the War Production Board approved increased civilian vehicle production and a largely unchanged version of the 1942 truck design was put into production. 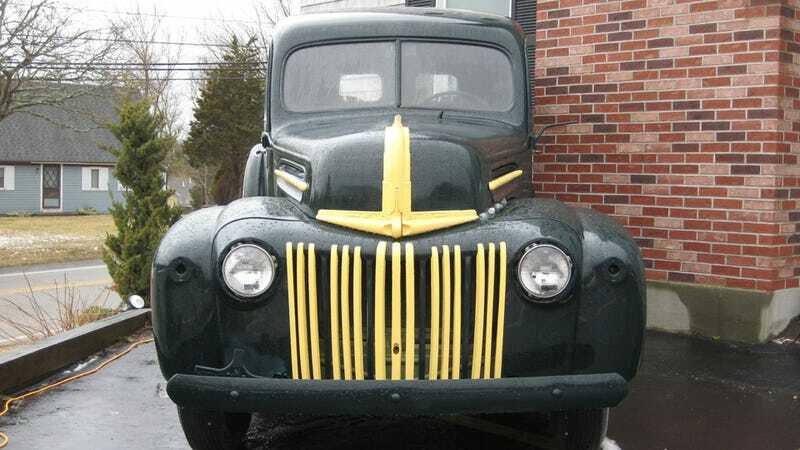 The Ford Trucks made between 1942 and 1947 were the generation of trucks were the last produced before Ford's famous F series was introduced and represent an interesting time in the history of the company. Henry Ford finally relinquished control of the company to his grandson, Henry Ford II, in September of 1945. The company was not on solid financial footing and Henry Ford II was faced with a sizeable task in turning the company around. Henry Ford died a few years later in 1947 at the age of 83. In a way these trucks were the end of an era, marking the decline of Henry Ford's role in the company and the last commercial vehicles before the era of the F series began. Even though the war was over there were subtle reminders even in the vehicles built in the years following of what had happened. Many of the trucks Ford built between 1945 and 1947 were shipped with a tireless rim in the spare tire holder because of a lingering post war rubber shortage. This solid old truck gives no clues to the changes at hand when it was built other than the fact it was definitely long ago. Visible from the roadside on a gray winter day, this brightly accented old truck looks out of place, as you imagine a 65 year old vehicle would. Although it was built to work when new, these days the old panel truck's main job description is eye catching for a restaurant on the cape that rust remembered. The truck has been sitting where you see it on and off for several years. At one point last year, the truck's position on the hill was stolen for a couple months by a red 1940 Chevrolet, but otherwise it usually where you see it. The Ford shows the evidence and the painted over chrome of a vehicle that has spent the winter outdoors. I was unable to get in touch with the owner to find out when the truck was last driven, but the fact it is chained in place doesn't inspire confidence in the truck's mechanical capabilities. Many who pass by probably see the old truck as little more than an ornate sign, but every time I drive by the old truck I can't help but wonder. I wonder about the first part of the panel truck's life, what it was used for and how it ended up where it is. To be honest, I was a little relieved when after several attempts I was unable to get in touch with the truck's owner. Sometimes with old vehicles like this panel truck I think wondering about its past is more fun than actually knowing.